That force of nature called Lance Armstrong concluded his unique reign as the King of the Tour de France in a manner that in hindsight seems inevitable, though there were moments when the ending of this tale of fortitude and determination could not be foretold with certainty. The Tour itself, of course, will continue in all its glory. As Lance put it on the podium in Paris, “Vive le Tour. Forever!” But the cyclist who set a new standard of six consecutive wins last year and topped it with number seven in 2005 has retired from the world’s most popular sport. What a way to go! Featuring extended coverage of the critical mountain stages, World Cycling Production’s two DVD editions – four hours and 12 hours in length – are truly artifacts of history, to be watched intently many times, shared with friends, and treasured for all time. Talk about drama! There’s the emergence of CSC’s David Zabriskie, Lance’s former teammate, edging Armstrong by two seconds to win the prologue and wear the yellow jersey for three stages before crashing just before the finish in the team time trial and withdrawing from the Tour the next day. There’s Lance’s friend Ivan Basso, also a CSC rider, trailing him by less than three minutes for most of the race, and finishing second overall. There’s the amazing, and then astounding, performance of Rabobank’s Michael Rasmussen, who won the climber’s jersey but plummeted from third overall to seventh after two crashes and three changes of bicycle in the final time trial. And, of course, ever threatening and supplying suspense, there’s Jan Ullrich, who seemed to have the individual time trial in his pocket, until Armstrong, determined to win a stage as well as his seventh tour, pulled out all the stops and bested Ullrich’s seemingly unbeatable time by 23 seconds. It was a feat that left the race commentators totally depleted of superlatives and thrilled viewers throughout the world. 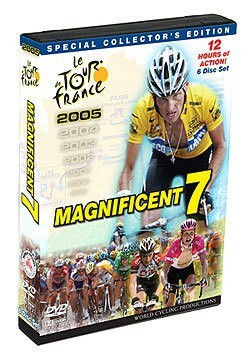 Narrated by Phil Liggett and Paul Sherwen. !